Reducing stress and anxiety is easier said than done. I have a friend who has ended up in the emergency room many times because he believes he is having a heart attack, but he has never had a heart attack. He suffers from panic attacks. He has tried many things to stop the overwhelming feelings of panic and anxiety. If you have never had a panic attack, it is hard to imagine the distress it causes. The closest I have felt to a panic attack is when I started running. When I would run a little too hard, my heart would pound and I would start to get light-headed. That is how a panic attack feels–with one major exception. All I had to do was slow down and walk for a few minutes and the feeling would pass. When you are having a panic attack, you feel like you have no control. Mindful meditations are a simple way to reduce stress and anxiety. My friend learned to calm his mind and relax his body with relaxation exercises and mindfulness. These exercises can help you too. Even if you don’t get panic attacks, mindful meditation will help you get control of your thoughts, calm your mind, and relax your body. According to the American Psychological Association, research proves mindfulness has many benefits. 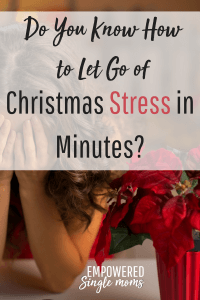 These benefits include reducing stress, boosting memory, reducing emotional reactivity, increasing adaptability in difficult situations, improving relationship satisfaction, improving immune function, and reducing anxiety. Start practicing mindfulness by focusing on what is going on right now in this moment. When your mind begins to wander, bring it back to right now. This is also a helpful technique when you are worried about what happened yesterday or what will happen tomorrow. Bring your mind back to what is happening in this moment. Notice what you can hear, see, smell, touch, and taste. Focusing on the information you bring in with your five senses will ground you in the moment. Overwhelmed? When you are feeling scattered with a million things to do, focus on this moment and what is good about this moment. Once you have grounded yourself in the present, identify the next best thing to do. When you are alone, you can take a few minutes to focus on deep breathing. I particularly like the 108 meditation for this. It is easy to learn and rewarding because you can observe your progress. To do this you focus on diaphragm breathing. I find it helpful to put my thumb on my belly button and rest my hand on my abdomen to remind me to diaphragm breathe. Breathe in and out slowly–that is 1. Continue until you get to 108. You may lose track. There is no need to start over. Just pick up where you think you left off. When other thoughts come into your mind, name them and let them go, keeping your focus as much as possible on your counting and breathing. Music can relax your mind. Try Amazon Prime 30-Day Free Trial and checkout the Baby Making Jazz playlist, which is one of my favorite playlists to enhance mindful relaxation. Or try this playlist on YouTube, Peaceful Sleep Music. Progressive muscle relaxation is just what it says: you progressively work your way through your body relaxing your muscles. Sometimes it is done by tensing and relaxing your muscles. This relaxes your body and calms your mind. Below is an example of how it is done. Guided imagery is imagining yourself in a calm, safe, relaxing place. Often the imagery will start with a focus on your breath or deep muscle relaxation. Here is one about being at the beach. Here is a guided imagery where you are in the woods. Here is a short one about visiting a waterfall. 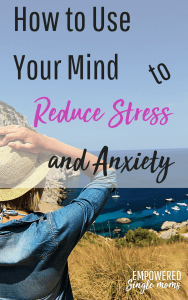 You can use the power of your mind to reduce stress and anxiety by controlling your thoughts. Like any other skill, this takes practice, but it can be done. The vast majority of stress and anxiety is past or future negative thinking. We may spend enormous amounts of time worrying about what could happen and multiple ways things could go wrong. Most of these things never happen. Stop wasting your precious time stressing over things that will probably never happen. The other thing we do is think about the past and what we could have or should have done differently. It is good to learn from our mistakes, but once we have decided how the past can instruct our future, it is time to let go of it. Pick a technique to help keep you in the moment. When our thoughts are focused on the positives in the here and now, it is very difficult to be stressed or anxious. Guided imagery, deep muscle relaxation, and focusing on breathing are all ways for us to stay present and positively focused so we can kick stress and anxiety to the curb. Try at least one of these techniques. You will be pleasantly surprised how much just a few minutes once a day can reduce the stress and anxiety in your life. Here are some books that are also helpful in reducing anxiety. This article is part of a series, Secrets for Success from Single Mom Bloggers. You can see the other articles in the series here and check out the other secrets. Thanks to Raising Biracial Babies, Learning 2 Bloom, Unstoppable Betina and Sunflower Mom for joining me in the series. Sign up for my newsletter so you are sure to get the rest of the Secrets to a Successful Life.